Banff National Park, Alberta, Canada. The particularly vivid blue of the lake is caused by rock flour suspended in the water. A national park is a reserve of land, usually, but not always, declared and owned by a national government, protected from most human development and pollution. 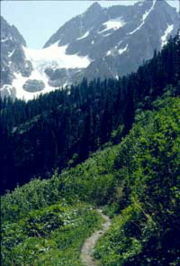 National parks are a protected area of IUCN category II. The largest national park in the world is the Northeast Greenland National Park, which was established in 1974. The first national park to be established in the world was Yellowstone National Park in 1872, which covers parts of the U.S. states of Wyoming, Montana and Idaho. 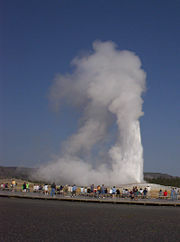 The U. S. National Park Service provides technical assistance and advice to countries around the globe. Those involved in the national park systems understand that natural resources such as air, water, and animals cross international boundaries. With this in mind, related organizations have spawned, such as Partners in Flight (conservation of bird populations), the UN Man and the Biosphere (MAB) program (research on the function and management of ecosystems and integrated development) and UNESCO World Heritage Sites or Biosphere Reserves (conservation of sites deemed to be of outstanding cultural or natural importance to the common heritage of humankind). In 1810, the English poet William Wordsworth described the Lake District as a "sort of national property in which every man has a right and interest who has an eye to perceive and a heart to enjoy". The painter George Catlin, in his travels though the American West, wrote in 1832 that the Native Americans in the United States might be preserved: by some great protecting policy of government ... in a magnificent park ... A nation's park, containing man and beast, in all the wild and freshness of their nature's beauty! Similar ideas were expressed in other countries—in Sweden, for instance, the Finnish-born Baron Adolf Erik Nordenskiöld made such a proposition in 1880. The Scottish-American naturalist John Muir was inspirational in the foundation of national parks, anticipating many ideas of conservationism, environmentalism, and the animal rights movement. The first effort by any government to set aside such protected lands was in the United States, on April 20, 1832, when President Andrew Jackson signed legislation to set aside four sections of land around what is now Hot Springs, Arkansas to protect the natural thermal springs and adjoining mountainsides for the future disposal of the US government. It was known as the Hot Springs Reservation. However no legal authority was established and federal control of the area was not clearly established until 1877. [T]he said State shall accept this grant upon the express conditions that the premises shall be held for public use, resort, and recreation; shall be inalienable for all time. In 1872, Yellowstone National Park was established as the world's first truly national park. When news of the natural wonders of the Yellowstone were first published, the land was part of a territory. Unlike Yosemite, there was no state government that could assume stewardship of the land, so the Federal Government took on direct responsibility for the park, a process formally completed in October 1, 1890. It took the combined effort and interest of conservationists, politicians and especially businesses—namely, the Northern Pacific Railroad, whose route through Montana would greatly benefit by the creation of this new tourist attraction—to ensure the passage of the legislation by the United States Congress to create Yellowstone National Park. Even with the creation of Yellowstone, Yosemite, and nearly 37 other national parks and monuments, another 44 years passed before an agency was created in the United States to administer these units in a comprehensive way—the U.S. National Park Service (NPS). Businessman Stephen Mather pushed hardest for the creation of the NPS, writing then-Secretary of the Interior Franklin Knight Lane about such a need. Lane invited Mather to come to Washington, D.C. to work with him to draft and see passage of the NPS Organic Act, which was approved by Congress and signed into law on August 25, 1916. The number of areas now managed by the National Park Service in the United States consists of 391 different sites, of which only 58 carry the designation of National Park. Following the idea established in Yellowstone, there soon followed parks in other nations. In Australia, the Royal National Park was established just south of Sydney in 1879. 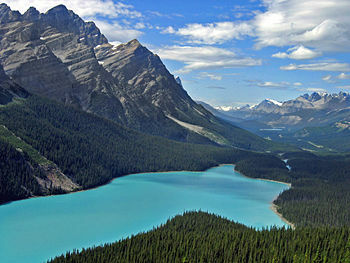 In Canada, Banff National Park (then known as Rocky Mountain National Park) became its first national park in 1885. New Zealand had its first national park in 1887. In Europe, the first national parks were a set of nine parks in Sweden in 1909. In 1926, the British administration in South Africa designated Kruger National Park as the nation's first national park. After World War II, national parks were founded all over the world. The Vanoise National Park in the Alps was the first French national park, created in 1963 after public mobilization against a tourist project. Bryce Canyon National Park in southern Utah, United States was established in 1928. It had previously been a National Monument. National parks are usually located in places which have been largely undeveloped, and often feature areas with exceptional native animals, plants, and ecosystems (particularly endangered examples of such), biodiversity, or unusual geological features. Occasionally, national parks are declared in developed areas with the goal of returning the area as closely as possible to its original state. In some countries, such as England and Wales, areas designated as a national park are not wilderness, nor owned by the government, and can include substantial settlements and land uses which are often integral parts of the landscape. Scotland's first National Park, The Loch Lomond and The Trossachs National Park, was established in July 2002 while the Cairngorms National Park was established in March 2003. Most national parks have a dual role as offering a refuge for wildlife as well as serving as popular tourist areas. Managing the potential for conflict between these two roles can become problematic, particularly as tourists often generate revenue for the parks which, in turn, are spent on conservation projects. Image of Kavir National Park, Iran from the air. Parks also serve as reserves for substantial natural resources, such as timber, minerals and other valuable commodities. The balance of the demand for extraction of these resources, against the damage this might cause, is often a very important challenge in national park management. National parks have been subject to illegal logging and other exploitation, sometimes because of political corruption. This threatens the integrity of many valuable habitats. Some countries also designate sites of special cultural, scientific or historical importance as national parks, or as special entities within their national park systems. Other countries use a different scheme for historical site preservation. Some of these sites, if they meet the criteria required, are awarded the designation World Heritage Site by UNESCO. In many countries, local governmental bodies may be responsible for the maintenance of park systems. Some of these are also called national parks. 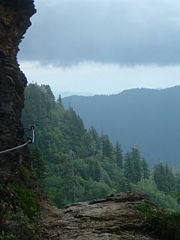 In the United States, most states have national parks, maintained by the state government. The National Park System of the United States is the collection of physical properties owned or administered by the National Park Service. This includes all areas designated National Parks and most National Monuments, as well as several other types of protected areas of the U.S.
As of 2007, there were 391 "units" of the National Park System. However, this number is somewhat misleading. For example, Denali National Park and Preserve is counted as two units, whereas Fort Moultrie National Monument is not counted as a unit because it is considered a feature of Fort Sumter National Monument. In addition to areas of the National Park System, the National Park Service also provides technical and financial assistance to several "affiliated areas" authorized by Congress. Affiliated areas are marked on the lists below. 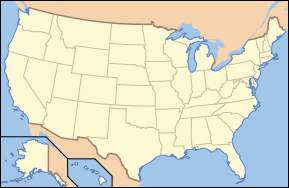 Delaware is the only state without a unit of the park system. Units are also found in Washington, D.C., Guam, American Samoa, the U.S. Virgin Islands, and Puerto Rico. As of 2006, there were 58 officially-designated National Parks in the United States and its dependent areas. ↑ Americas Best Idea Has Come to Death Valley National Park DesertUSA.com. Retrieved December 8, 2007. This page was last modified on 9 November 2018, at 18:09.